Okay, second attempt at writing this entry after accidently kicking the plug out of the computer – twice. I haven’t been very active on the blog front of late; this is because over the last six weeks I have been busy, very, very busy. This busy-ness has come in the form of attending Loncon, making my panelist debut at Shamrokon, taking on new duties in the day job and of course doing final preparation for Book Three of the Nameless War – The Last Charge, which goes live tomorrow morning – in fact the paperback is already available. That last point I really didn’t think I was going to achieve on time, but I guess practice does make perfect. Tomorrow morning the book will hit the digital shelves, the six hundred odd people who have pre-ordered will receive their copy and I – at risk of sounding over dramatic – will finish what has over the last ten years, become a fairly major part of my life. So I suppose the question becomes what do I do now, now that I have completed my side of the bargain and finished the series? Well I can tell you one thing I am NOT going do: that is follow the suggestion of one friend who has put forward the idea that I should write trilogy in four parts. No, NO, NO! I am not Douglas Adams. I will continue write. Writing is and remains a pass time I enjoy (the money angle doesn’t hurt either), I enjoy the process of getting the collection ideas down and linking them into a coherent whole. I enjoy the creation of my characters, I enjoy building the worlds they inhabit. I enjoy self-publishing with the challenges and opportunities it brings. 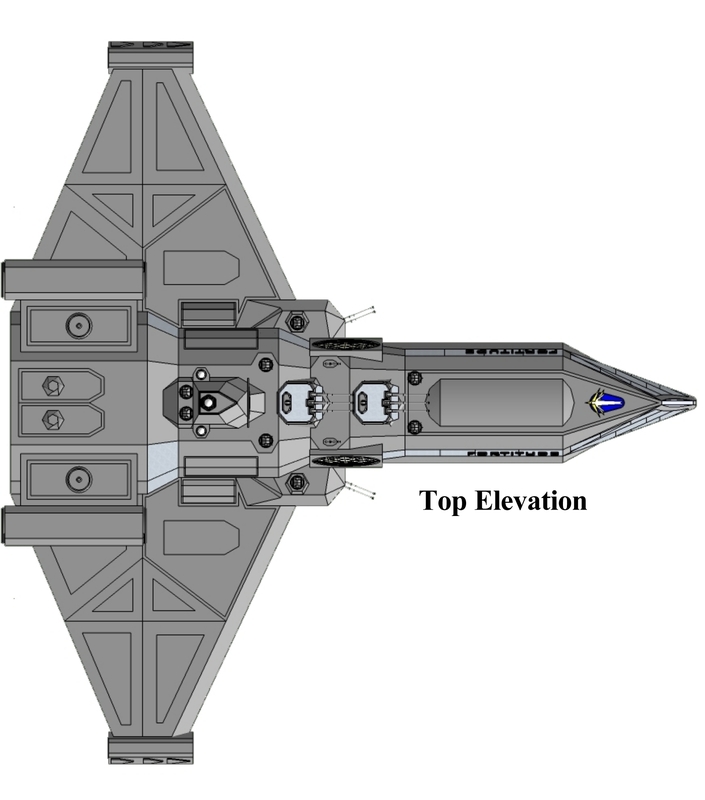 I have ideas for the future; readers of this blog will be familiar with my Ships of the Fleet project, its future depends on how the first one is received. 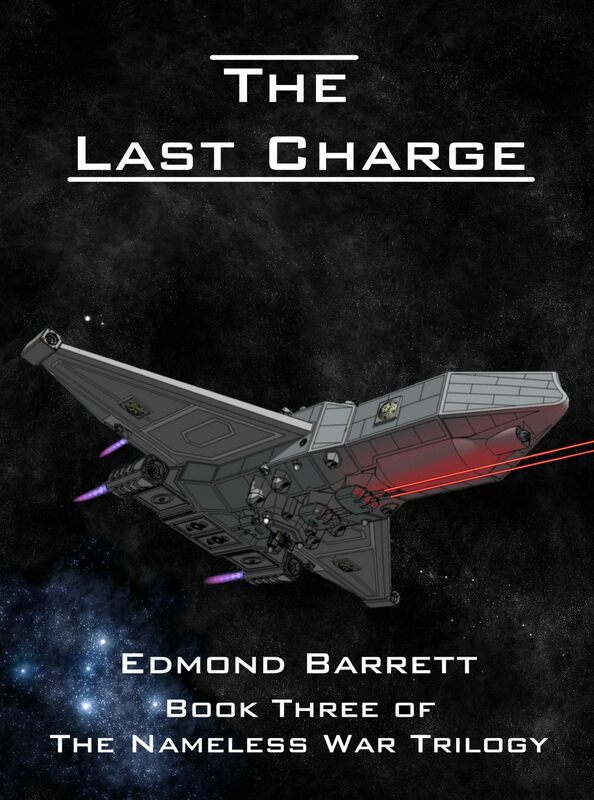 There is also a long parked side project which I have begun to look at again and perhaps longer run the Battle Fleet universe has more tales in it. When it comes to the immediate future one thing is for sure though. I’m taking October off and booking a holiday – Malta looks nice. Oh PS, for anyone who hasn’t yet read The Nameless War, on the 1st October to celebrate the arrival of Book Three is it going on sale. 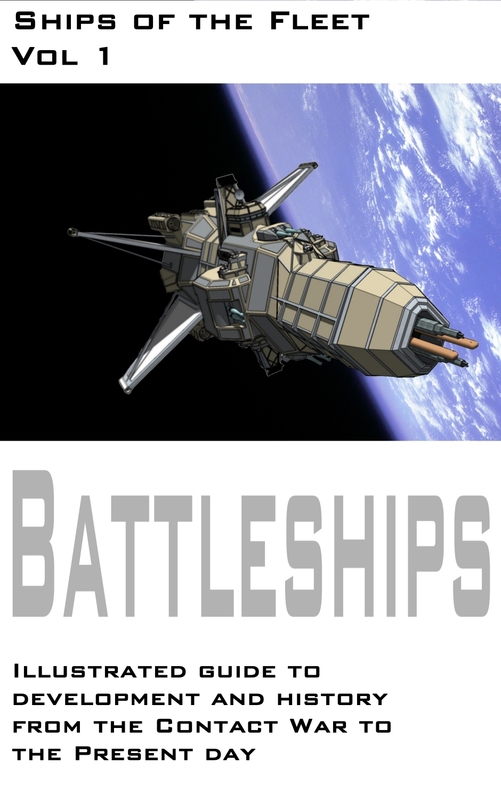 I am please to announce that my often mentioned side project Ships of the Fleet – Battleships is now avaliable for pre-order on Amazon. In the forty years since First Contact, humanity has gone from a species confined to a single world, to one that has expanded across the stars. Along side this march, has been the battleship. This illustrated guide traces the rise and development of the battleship, through years of the Contact War to the present day – covering the shifting technological, strategic and political factors which have influenced the development of these vessels. This fascinating study is an indispensable guide for any student of starship design and fans of the Nameless War series. The people have just had a sample sent out to enjoy, the entries for Fortitude and Warspite are going to remain available here to enjoy. 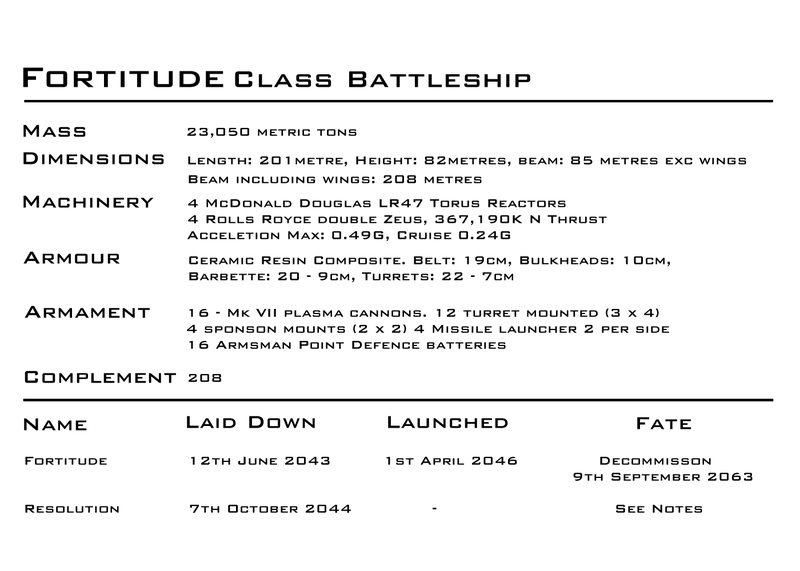 The completion of the Titan class and declaration that the fleet would be pegged at a ratio of one for two against the Aèllr defence fleet, resulted in a break in battleship production, although design work continued. While this was viewed as wasteful by some commentators, the fleet felt that it was necessary to both retain key personnel and keep abreast of technical and tactical developments. This work resulted in a number of designs but the lack of government authorisation meant that these remained purely paper projects. The modernisation of Fortitude, with emphasis placed on acceleration, marked the beginning of the fleet’s interest in a fast battleship. 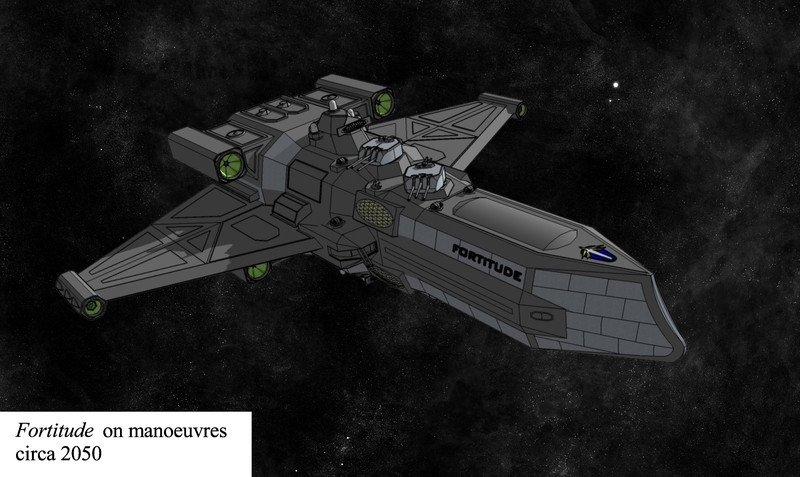 The likely decommissioning of Fortitude in the early 2060s offered an opportunity to replace her with a ship that retained her best features, while capable of standing in the main battle line. Building a single battleship to an entirely new design seemed uneconomic and initially it was thought more likely that the fleet would have to settle for an improved design – the Titan class. The Aèllr’s announcement that they intended to build five of the Gqrru class (largely as a response to Fortitude’s possible role as a heavy raider) changed the calculations. With the mothballing of Fortitude, there was now the opportunity to build a full class of three ships, while remaining within the required ratios. 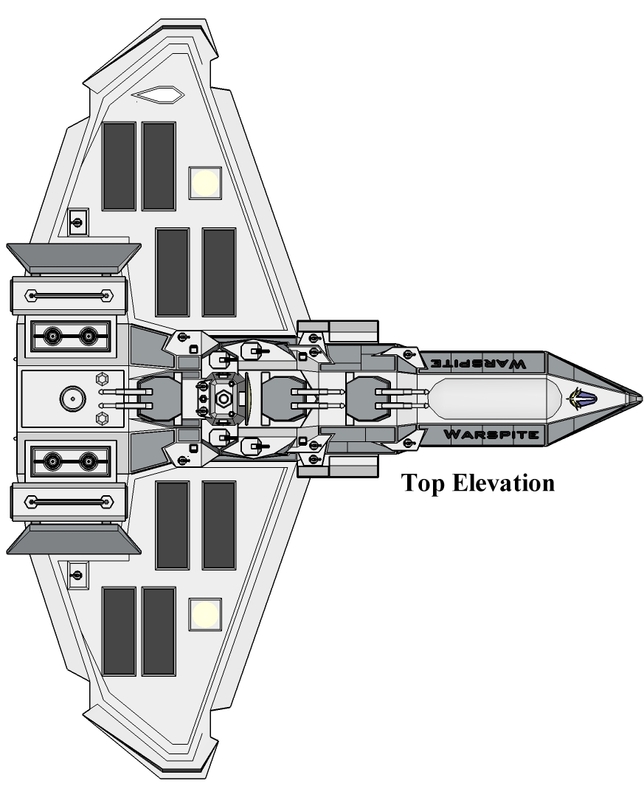 The armament and broad layout of the Titans was regarded as an acceptable starting point. Indeed, it was felt that to significantly upgrade the weapons package would risk restarting an arms race with the Aèllr, with such a course of action likely to result in the block obsolescence of fleet’s existing battleships. Beyond this there was significant divergence from the earlier class. The completion of Baden Base and its fixed defences meant that the large amount of fuel and stores carried by the Titans were no longer viewed as essential. 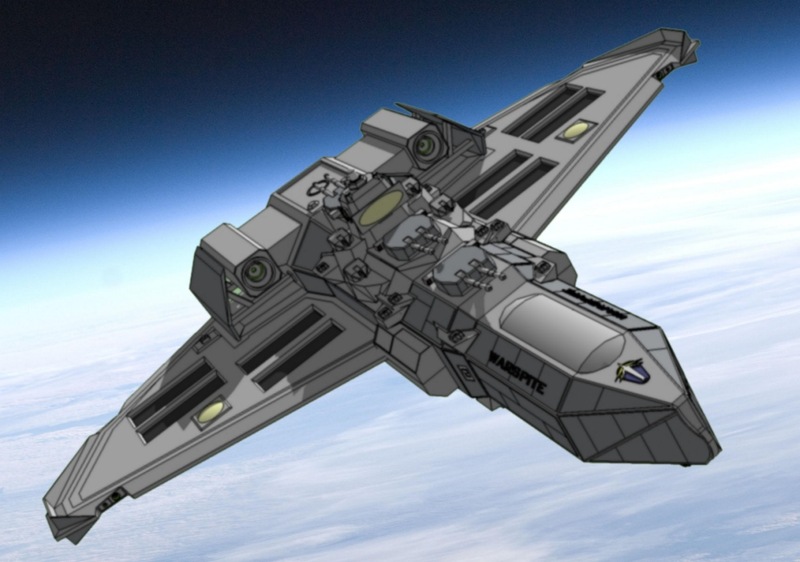 This led to the abandonment of the outer case with shuttle bays once again positioned external to the main hull. Propulsion was to be provided by the McDonald Douglas WRS4 Bearcat engines, which were a development from the failed Wildcats. These engines had suffered a particularly torturous development cycle and questions were asked whether the fleet was again risking finding itself with a ship slower than originally planned. Although these engines had successfully completed extensive trials on board the fleet’s test ship Fusionia III, it is a reflection of prevailing concerns that the decision was made to fit them to the Akagi, second of the Yorktown class carriers, as a further test. The success of the engines in service laid these concerns to rest. To achieve the necessary level of thrust, six rather than four would be needed. Four were to be double-ended, providing both acceleration and deceleration thrust, while the other two would be half-engines providing acceleration only. Protection would gain from developments in civil engineering. 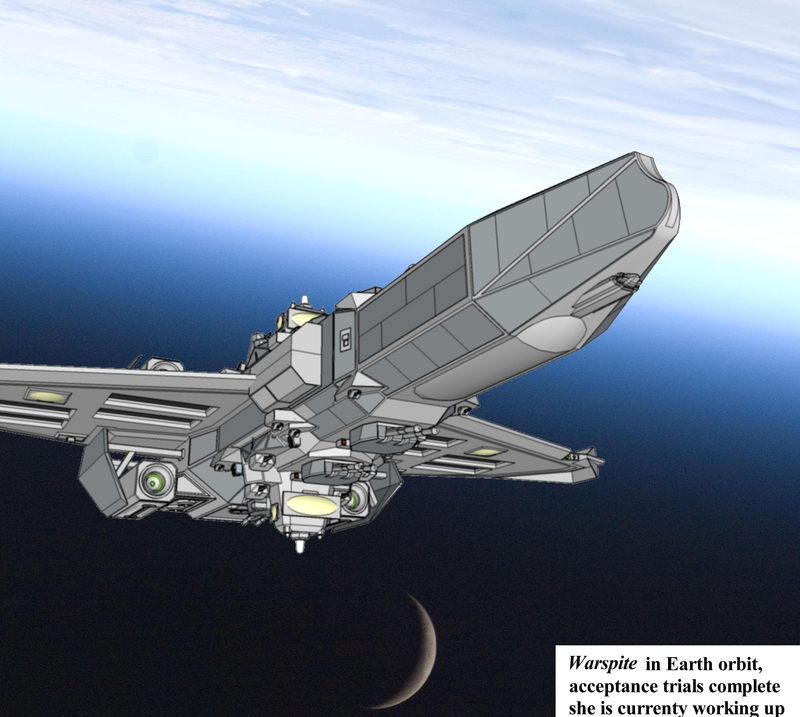 The advanced composites developed to form the tether for the space elevator programme could be adapted to serve as armour protection. The improvement of protective performance was such that although the mass of the armour on a Warspite would be only eighty-seven percent of that carried on the Titans, the level of protection would be slightly enhanced. At time of writing only Warspite has entered service. She has successfully completed her acceptance trials and it is expected she will be fully worked up in time for the fleet’s annual manoeuvres around Dryad. The remaining members of the class were due to be named Goeben and Resilient, after the World War One battlecruiser and the fleet’s first battleship respectively. However this led accusations of an excessively Anglo/European slant to the fleet’s naming policies. For this reason the fleet has recently announced that these ships will instead be named Yavuz Sultan Selim and Mikasa. The former is due to enter service in 2068, while work on the latter has not yet begun. As the Warspite class has only just entered service, few meaningful conclusions can yet be made. Certainly the class is significantly different from the Titans – a demonstration for students of ship design that there is no such thing as a ‘perfect’ design. Instead designers face a series of altering, often conflicting, requirements and must seek the best compromise between them. 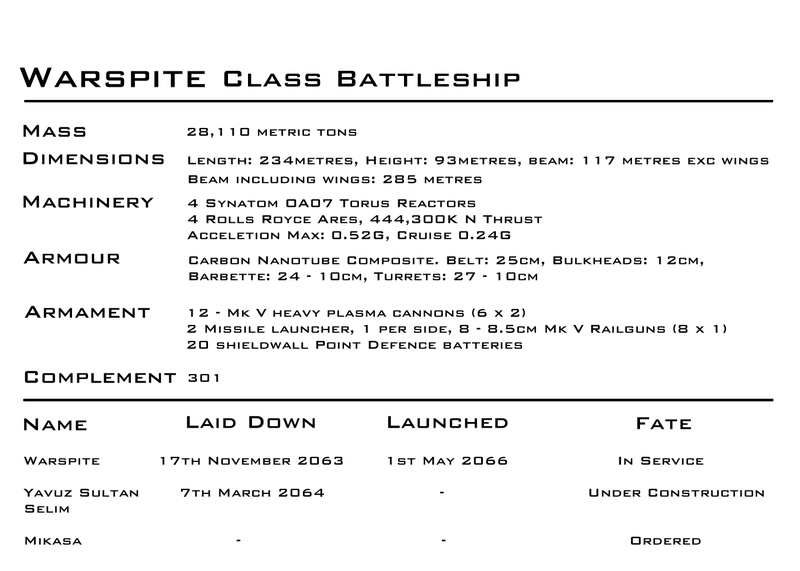 What is certain is that barring a major paradigm shift, the battleship will remain the dominant space combat unit for the foreseeable future. The precise layout however of any future battleship design will be shaped both by the technologies available and perceived threats they will face. The recent encounter between the cruiser Mississippi and an unknown alien ship is a reminder that we cannot be certain what form future threats will take. 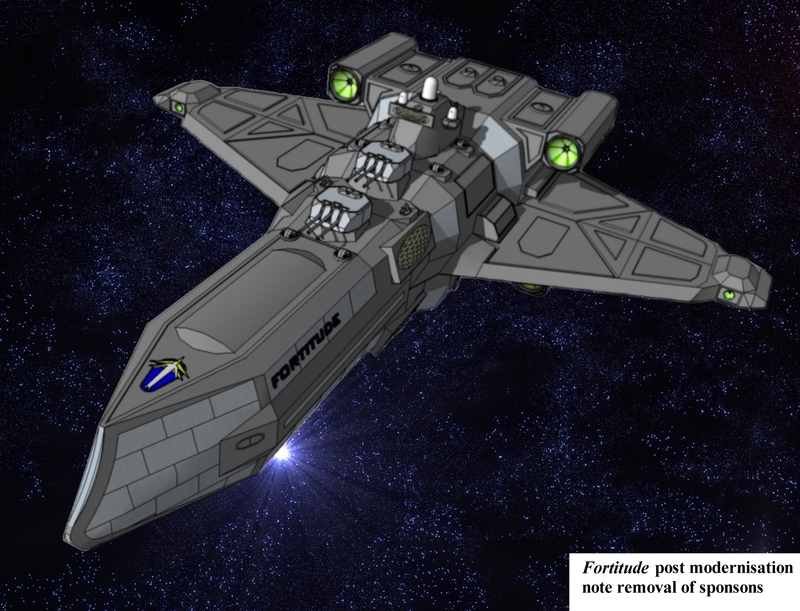 The alien ship is understood to have used missile armament exclusively and fired from ranges well in excess of even heavy plasma cannon range. It is understood that the fleet is currently examining the records of the clash and this may feed into design of the second and third ships of the class. No details are however available at time of writing. So today’s the day for the Scottish independence vote. I honestly think the yes campaign has taken far too much of an it-will-be-alright-on-the-night approach to some pretty serious questions and have left their supporters open to some nasty surprises not very far down the road. On the other hand for the independence movement to have even got this far is a pretty damning indictment of the public schoolboys and union officials that make up the Westminster ruling class and have presided over seventy years of managed decline by the UK. No matter what the result business as usual is not going to be an option. Also if Scotland does become independent will there be panic buying of haggis? Because if so that would be offal. Those of you on my mailing list will be getting a sample chapter later this week just to whet your appetite. Last weekend was a busy one with final changes to the text, finishing touches to the cover art and tweaking the blurb. This evening will see the first attempt at uploading the text to the Amazon system. I thought I was going to get to it last night but then found that a few things have changed in the upload procedure and decided this was not the sort of thing to tackle 10pm. I’ll go in fresh this evening. I haven’t done a new upload in two years and a couple of things on the Amazon system have changed. There now appears to be a pre-order option which is interesting – watch this space on that. The end however is definitely hoving into view.